If you have been blogging for a while, then you probably have hundreds of links pointing to other sites from your blog posts. These outgoing links play an important role in your site’s overall search engine optimization (SEO). If you want to analyze these external links to find broken links or links that have changed, then it’s normally a manual process. Thankfully our friends over at Search Engine Journal created an easier solution. In this article, we will show you how to analyze your links in WordPress with LinkPatrol. LinkPatrol is a WordPress plugin that helps you find, review, and clean up links in your posts and pages. 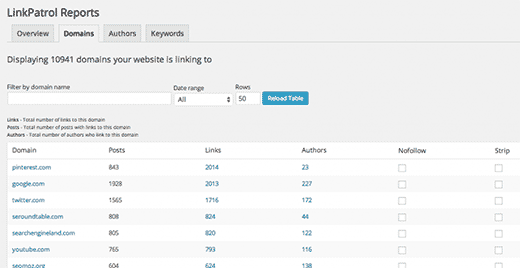 You can sort by domain, sort by authors, keywords, etc. It allows you take action such as nofollow or strip links in bulk thus saving you a lot of time. Why You Need to Monitor and Fix Outbound Links in WordPress? When you link to any URL, search engines count it as an endorsement. This means you are actually sharing your SEO points with the site you are linking to thus the term linkjuice. You are probably thinking that isn’t it good to link to websites you love and find useful? Actually it is very good, but the problem is that you have no control on the content of those websites. The content that you linked to can be changed by the website owner. They can sell the website to someone else who may change it or take it down. Worst of all, the domain could expire and some one acquires it to put inappropriate content there. You don’t want to be associated with those sites. Sometimes website owners move their site to a new location or change the permalink structure. If you were linking to an article on their site, then your users will see a 404 page instead of the content you linked to. This creates bad experience for your users which is not good for your website. In this example, the Example Website is the anchor text. Anchor text describes to your users what they are going to find when they click on that link. If you allowed guest authors in the past, then there is a very good chance that they used generic terms, or keywords for SEO purposes. You may want to get on top of that now that the Google algorithm has changed. Sometimes you link to an article which contained useful information at that time. However, after a while this information becomes incorrect or outdated. For example, at WPBeginner we often show our users how to use different plugins and tools to do something on their WordPress site however sometimes those plugins and tools become outdated or their authors stop supporting them. We try our best to replace those links with the most up-to-date tools and plugins. First thing you need to do is install and activate the LinkPatrol plugin. Upon activation you will notice LinkPatrol menu item in your WordPress admin bar. Clicking on it will take you to LinkPatrol Scanner. 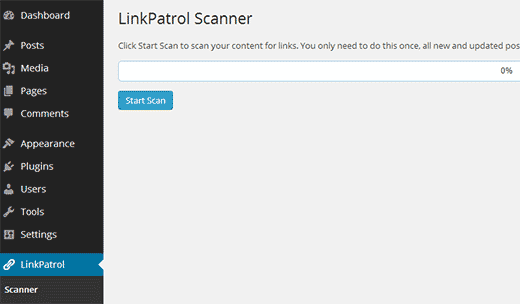 On the LinkPatrol Scanner page, you need to click on the Scan Now button. LinkPatrol will now scan all your WordPress posts, pages, and custom post types for outbound links. Once the scan is finished, it will redirect you to the Reports Dashboard where you will see the overview of all your outbound links. To see more details, you need to click on the Domains Report tab where you can see all the domains you have linked to. 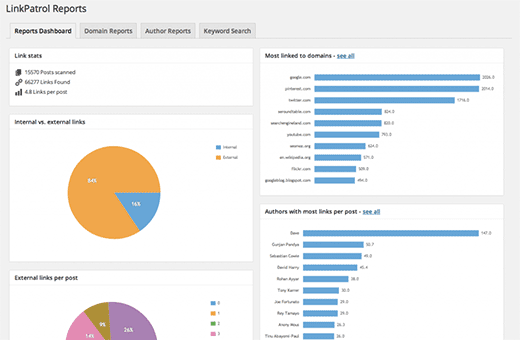 LinkPatrol will show you each domain, and how many times you have linked to each domain. You can add the NoFollow tag to any domain by simply clicking on the NoFollow checkbox next to it. 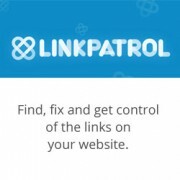 LinnkPatrol will add a nofollow tag to all the links pointing to that domain. 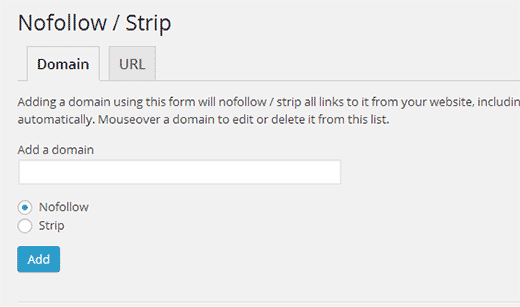 You can also remove all links pointing to a particular domain by clicking on the Strip checkbox next to it. You can also view all the links for each domain by clicking on the link count next to it. Author report tab shows links created by each author on your website. Keyword Search tab allows you to search your links for specific keywords. 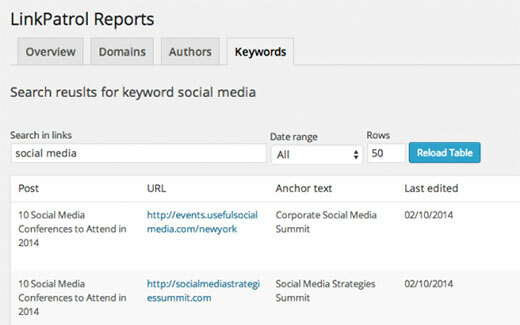 LinkPatrol will look for the keyword in anchor text and link URLs. LinkPatrol allows you to easily remove or add a nofollow tag to all links pointing to a particular domain name. Go to LinkPatrol » Nofollow/Strip. Add the domain you want to target and select to nofollow or strip. We hope that this article helped you analyze your links in WordPRess. fix and manage outbound links on your WordPress site. Slobodan, do you offer discounts? You should mention it’s a paid tool and not free in the article. Actually LinkPatrol is a totally different plugin than Broken Link Checker. In your experience does LinkPatrol work well for LARGE WordPress sites? The free Broken Link Checker became a performance problem for our site in recent months, and we are looking for a replacement that does not churn through the database so heavily in its use. Disclaimer: I’m part of the team that created LinkPatrol. We’ve been using it at Search Engine Journal (16K+ posts) before it was publicly available and have had no performance issues at all. The way LinkPatrol works is that it scans all your links when your first install it and then scans individual posts when you publish them, or edit after publishing. The initial scan took around 20 seconds at Search Engine Journal and with close to 70K links we’re seeing no performance issues. Any scope of adding features like “broken link checker” or outgoing links to “low quality sites”? I know. The question was how to recognize bad links, and the answer for me, is to use Broken Link Checker. For most sites, Broken Link Checker manages links to a more than satisfactory degree. I’ve found that it has even helped me to ascertain shoddy hosts from good ones due to sporadic checks on the part of BLC. When I’ve gone back the links are find but if I keep getting alerts that tells me the host is not up as often as they’d have you believe. But how can one recognize the bad links? For example, how would I know that if an outgoing link is leading to error 404? It costs like $100. I can spend that much if it gives me a little more than just providing all the links on my website. Use the free plugin Broken Link Checker to check for bad links. I’ve been using if for 4 months, and it works very well. Thanks for the plugin suggestion Nancy. After that, you need to delete the theme you have re-worked from live site. Upload the customized theme from your local server to your live site.